How much would it cost to build up a BSA Otter with new frame kit in 2017 We take a look. Building a BSA Otter from scratch in 2017. the price of a build. 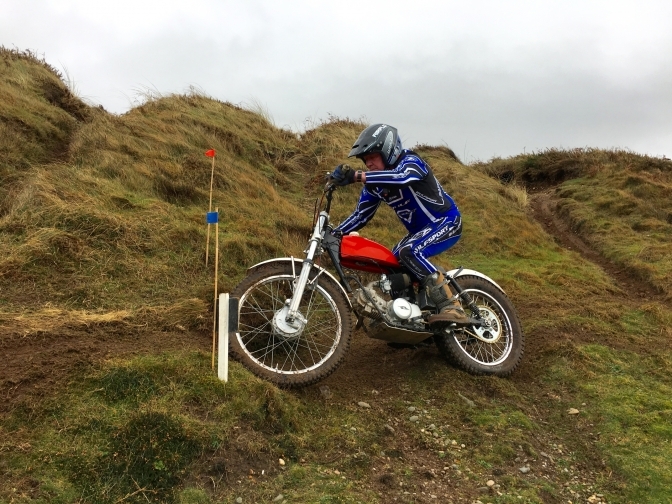 "Foster BSA Otter in Manx trial 2016. The cost of building up a BSA "Otter" Today 2017. After chatting with a mate over a cup of coffee we were discussing the cost of Motorcycles today, and not just trials bikes. 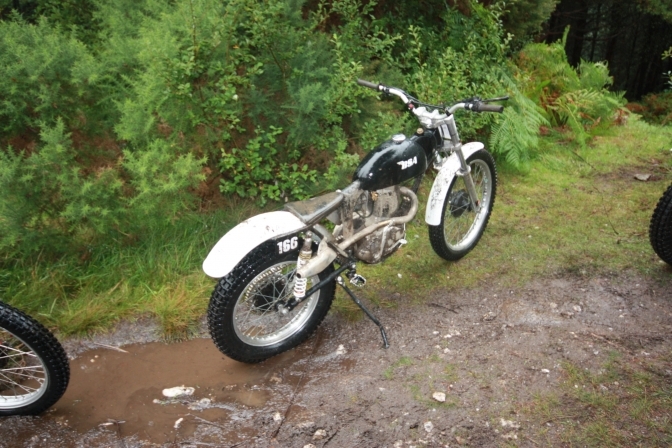 So I said even building up a BSA Otter from scratch to my specification is not that cheap now-a- days but a lot cheaper than buying a new modern trials bike that halves its value in twelve months. So here is today’s guide to what I think it will cost. Well it looks like Howard now only makes the Mk three Faber frame. and in batches of ten when he has ten orders. I am waiting for conformation from Howard on price, but I think they are now £850 for the frame and swinging arm. When we have the first five “Foster Otter” frames finished shortly they will be approximately £1200, including frame swinging arm, prop stand, footrests, sump shield all powder coated in black, there will also be the addition of tapered steering head bearings. The Faber frame will need to be powder coated at £110 plus footrests at the cheapest £22.50. And a stand and fittings needs fabricating and welding to the swinging arm. I am sure Howard still does this at extra cost. So we have a start with a frame set. Next we need to make this into a rolling chassis. So we need a set of rear shocks I now use Falcon steel at £140, you can go for the cheaper Spanish made units that start at about £!00 and up to the most expensive at about £450. We then need a pair of front forks, Well you know I fit the Triumph/BSA Four stud to my builds, so we will base a price on these and I must say they are rising all the time in any condition. So expect to pay £250-300 for a pair that needs a complete overhaul, new stanchions will set you back £59- 110, then you will need a seal and washer kit that you can pick up for about £40 from L Harris, or there dealers. 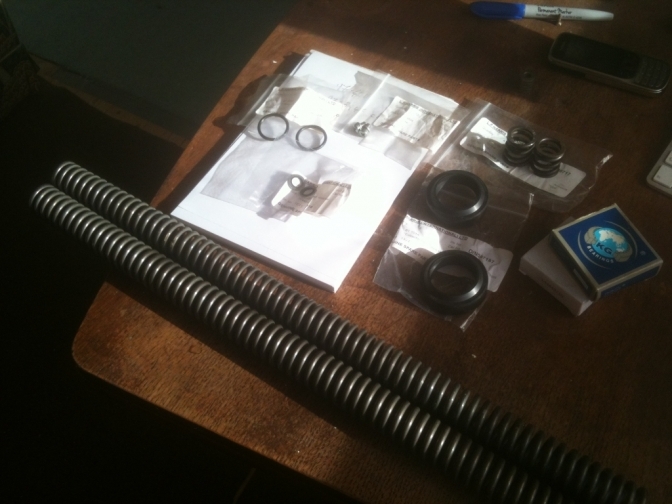 You will need head bearings for the Faber frame and a couple of sleeves making up. The Foster frames have these and the sleeves to fit the four-stud forks. I only use Yamaha TY 175-250 front wheels now. And has long as you don’t get an entry for the Scottish trial these are fine. You will have to pay about £100 for a serviceable TY250 wheel with the 160 rim fitted the TY175 rims are usually only 140 size. And is OK if you can get a wide 275 front tyre on, but really you need a 160-section rim. Brake shoes are about £20 average some are dearer if they are top of the range. A brake plate holding arm will, need making unless you have the fork sliders with the square strip up the outside, and the bottom lug as in the picture, you can then use the Mike Waller fixing method for these plates just using a appropriate bolt and spacer. 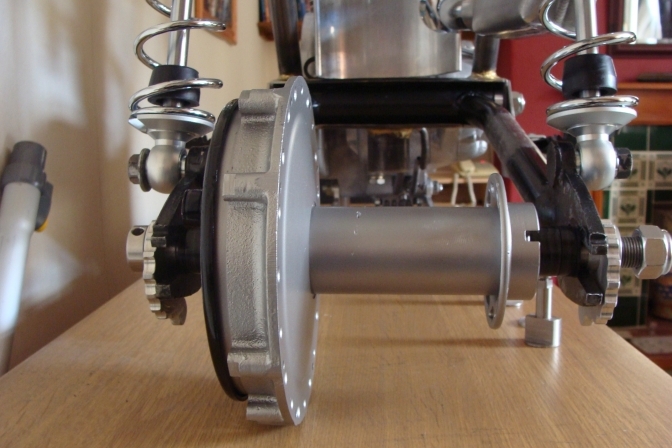 Yamaha hub attachment with bolt on the "Mini Otter". Neat, Mike thanks, it works very well. Front tyre and tube will cost from £50 and 15 respectively. Use electrical tape for a rim tape it works better four or five times around will do the job. Back wheel, well life starts to get complicated with what to use. To be honest if you use a BSA Bantam rear hub it really still needs making wider, by 1 ½” but you could be alright with the Foster frame as the frame is narrower than the Faber one. If you can do the job or have a mate with a lathe and welder do the mod (Look at the page) for doing this. You may pick up a good hub and back plate for about £30. So you then will need a set of spokes if you are going to build the wheel up yourself, for a standard hub you can pick these up for about £50 if you are lucky, but you will need one off longer spokes made if you widen the hub, and these will cost more. A WM2 alloy wheel rim with forty holes is going to cost you £140 and a tyre and tube £70+ and 15 again and two security bolts £15 each. If you get someone like Central Wheels to do the job for you after taking them the painted or powder coated widened hub that is going to cost £30 to paint, will set you back about £400? When you pick the wheel up. Right we now have a bike on wheels. That needs some accessories, firstly the front needs a Triumph adventurer front mudguard stay from Sammy Miller Products at £45, I have tried other methods of holding the front guard and making my own copy, and it works out cheaper to buy one of these. Front guard cheapest £20 plastic to £50, and an alloy front guard if you can get one probably Terry Weedy is your best bet like a lot of the accessories. £50/ again. Renthal bars £36-72, lavers £20-75, throttle £15-25, and cut-out switch £5-10 grips £15-20.moving to the back; Plastic or alloy 5inch guard £20-70. If alloy, chain guard 35 from Terry. You can see the difficulty you have with a B25 engine to get the carb line right. Now comes the expensive bit. You will have to pay £1000, for a BSA B40 GB engine in any condition, just to get the correct gearing for a trials bike, and if you think you can buy these gears to make a set if you can find them, allow £500 to achieve this. A BSA C15G engine is going to cost you again in any condition the same as the GB engine. 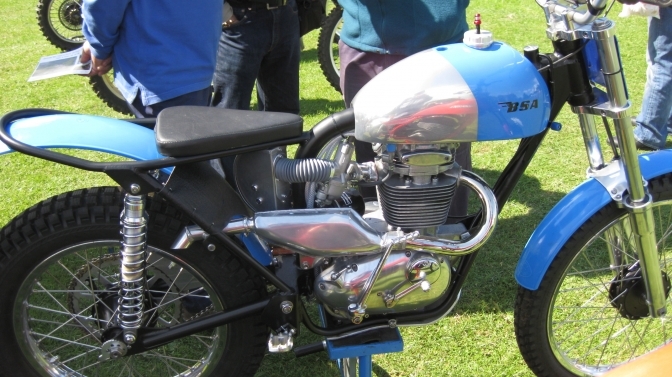 A BSA or Triumph B25-Tr25 engine is going to cost you £500-600 in any condition. And you know what trouble I had with one of the ones I bought. The biggest drawback with the B25 engine is the inlet track it just is wrong for a central seat-tube’d frame, without doing the cylinder-head modification that I have done on mine. So we strip the engines down for the modifications that need to be carried out. And if the engine is new you still need to gear them down for trials and now a days fit one of the electronic ignitions, although I am swaying back towards the Boyer Bransdon type, for a smoother engine pick-up. The biggest modification is machining of the lip on the drive side main bearing oils seal carrier to fit a narrower seal like Photo below. This done and the clutch removed to fit a smaller gearbox drive sprocket; you can now rebuild and fit your ignition to instructions. A new carb is probably the best bet, available from £89 for Amal or Wassel. If you are going to fit a Mikuni or copy you can get these for £22 upwards. Air box from Terry another £35 pound, and I have messed making my own, and thought what are you doing, buy one from the man. Ignition by the way £200 upwards and sprockets £20 each. I wont go into what you find on stripping your motor but I would allow £400 upwards for what you are going to spend. Unless you are very lucky and have some of the parts to hand. So we have our engine rebuilt and ready to put into the frame. one of the costs often forgotten is the nuts and bolts needed in a built. and one of the irritating parts, is not having them to hand when you need them, so think about this from the start of the build, and also the rest of the small stuff like tab washers etc. If you have watched the Mike Waller videos, and they are good and I will say got better as Mike as gone along. But the guy is always short of bits like bolts etc. and this delays any build. Well you have all these bolts and I bet you went for stainless didn't you be careful as some of the threads are a pain and put a bit of copper-slip onto the threads before use. Right the engine is now bolted in and head steady fitted. bolts again to fit coil guards filters etc. so we will add up the cost of fastenings and fitments as I think they are described as later. You will need something to hold the fuel in, a tank made of alloy will set you back about £345.00 New ,but you could go the second hand route, but they never have the same image as new, and a Otter is a difficult bike to fit a tank that looks right. You know I fit my Glass-fibre tanks and use Aspen fuel on my builds but even making the tanks myself now costs me over £100. Moving back you also need a seat so budget at least £50 for one of these. Mudguards are not cheap any-more £50 for cheap plastic, and £100 for alloy that always look better on a new build until the first fall, and the new look dented image. So as I say we will get back to adding up the cost later. but now in 2018 some of the costs have already risen. You know how this goes from now I will continue it later. And start to add up the cost. But the only consolation is in building a bike up like this, it probably will never loose any of its value, in this uncertain world.